Not only did Watts get to write his movie script, he was able to direct, edit and turn it into an actual movie by the end of his ninth grade year. This year, as a 10thgrader, Watts is working on a new script while also concentrating on his core classes as part of a college prep curriculum. The Cleveland High School for Digital Arts is one of three newer high schools in the CMSD, each offering a well-rounded basic education along with special tracks to cater to those students aspiring to go on to college upon graduation, study special interests – like Watts is – and develop critical thinking skills to make an impact in the world. “The creation of schools like Digital Arts is a major goal of Cleveland’s Plan for Transforming Schools,” says Piet van Lier of the Cleveland Transformation Alliance. Passed by the state legislature in 2012, the Cleveland Plan seeks to provide quality options for all Cleveland children. 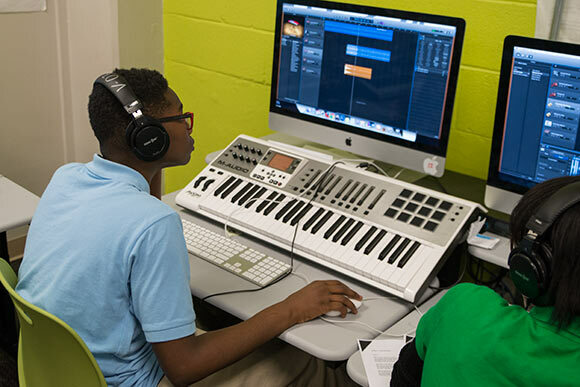 Digital Arts incorporates technology in arts, music and cinema around a core curriculum of college preparatory classes; Bard High School Early College allows students to earn an associate’s degree while earning their high school diplomas; and JFK E3agle Academy uses technology to master the skills needed for 21stCentury careers and college. Some of the teachers at these schools share their perspectives on what these unique programs offer students in the CMSD. Marsha Dobrzynski, executive director of the Center for Arts-Inspired Learningand Digital Arts advisory board chair, developed the vision for the school four years ago after watching students at the center creating a digital game about Egypt. What started as a game about modern-day Egypt and the Arab Spring eventually evolved into a game about ancient Egypt after the students began research for the game. Dobrzynski researched similar schools around the country and presented her idea to the Gund Foundation and Cleveland Foundation. Both foundations funded the school’s start up and provided funding again this year through the CMSD. The school opened as a CMSD public school at 1440 Lakeside Avenue in July 2014. For instance, last year the students filmed a cooking competition show that incorporated what they were learning about the Revolutionary War in chemistry, math, social studies, English and history. “We used history to research the foods available during the Revolutionary War, using their chemistry knowledge to win extra ingredients and cook the food and writing research papers about the era,” says Poland. The students filmed the whole show, and each student edited his or her own version of the show. Each school year is based on an “essential question.” This year’s question for ninth graders is “How does change happen?” Students are studying street drugs – the social impact of them in social studies, the chemical reactions on the body in science, and writing research papers on how drug consumption changes behavior and affects society in English. Digital Arts uses a learning mastery approach, in which students study a subject until they have a full knowledge of it. There is no such things as a failing grade, students simply stay at it until they have mastered it. Bard High School Early College first opened last year before moving this year to its new home at 13501 Terminal Ave. The school focuses on a liberal arts curriculum. Upon graduation Bard students not only receive their high school diplomas, they also earn an associate in arts degree from Bard College. The school opened to ninth graders and eleventh graders last year. By the time it reaches full enrollment, Bard will serve grades nine through 12. Eleventh and twelfth graders at Bard are known as “year ones” and “year twos,” respectively, because they are on track at that point to earn their college degrees. There are currently 260 students, most of them in ninth and tenth grade, and of this year’s twelfth grade class about 18 will graduate with their associate’s degrees in May. “It’s about access,” says Bard principal Dumaine Williams. “A lot of students don’t necessarily have access to liberal arts and college curriculums in high school.” It also alleviates some of the stress some students feel about paying for college. Alan Mintz, a working artist with a 26-year record of teaching in CMSD schools and at the college level, teaches art at Bard. “The atmosphere we’re trying to create is that of a college campus, rather than a high school,” he says. In teaching art, Mintz encourages his students to reflect on what they are doing, rather than just creating a piece of art. After more than 20 years in teaching, Mintz says he’s happy with the formula at Bard. “I feel very fulfilled as teacher, and I’m working my tail off,” he says. Bard students must go through an application process to attend the school. They must have a good GPA, write a creative, self-expression essay, interview with a faculty member or admissions counselor and provide a letter of recommendation. But admission is not strictly based on their academic record. “Basically, what we’re looking for are students who have a strong passion for learning,” says Mintz. Like Digital Arts, E3agle uses a mastery method to teach college preparatory classes and measure achievement. Rather than assign grades or fail a student who doesn’t complete the coursework satisfactorily, they simply keep at it until they have mastered it. Like Bard, the curriculum is designed to encourage critical thinking, active learning and leadership. E3agle also puts a technology spin on learning – every student gets a laptop. Classes are taught in the classroom and through an online curriculum. Also like Digital Arts, E3agle operates on a year-round schedule of 10 weeks on, three weeks off. Teachers spend one of the off weeks each quarter on professional development. These high schools are too new to be rated by the Transformation Alliance, tasked by the state with assessing all public schools in Cleveland on its website and in its printed School Quality Guide. “New schools like Digital Arts, E3agle, and Bard are very exciting in the context of the Cleveland Plan because they provide new opportunities for Cleveland families, quality options that can help guide students on the path to career and college,” says the Alliance’s van Lier.